When style counts, let Contempo Suits show you the way by steering you towards Daniel Ellissa brand dress shirt and tie combos. These fancy style dress shirts come with the matching tie combo for a head turning look that just plain works. 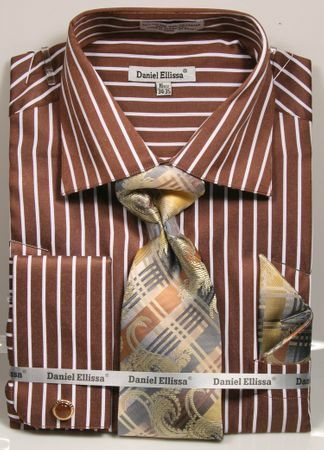 Made of brown and white stripe fabric, this french cuff shirt has plenty of classy style that Daniel Ellissa is known for.